Volunteer Gordon Pinger, of Bellaire, sorts donated food items outside the Garfield Plaza shopping center on Garfield Avenue on Tuesday afternoon for the Father Fred Foundation's 16th annual Frostbite Food Drive. 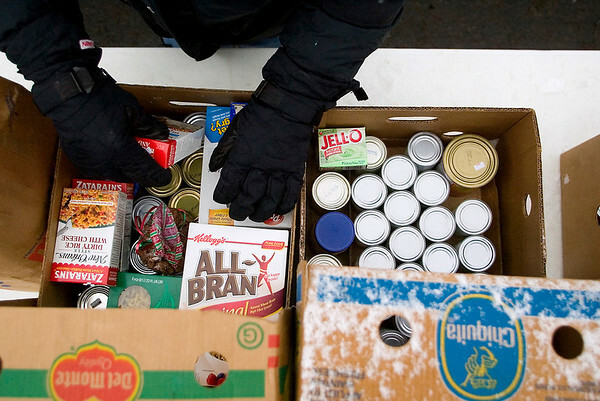 Volunteers are accepting donated food items and cash from 7 a.m. to 6 p.m. on weekdays, 8 a.m. to 6 p.m. weekends, for the foundation's food pantry, which helps feed more than 3,000 families in Northern Michigan. The drive ends Jan. 24.